Our organization offers a superior range of Shoesto our clients at competitive prices. These are checked on various quality parameters before the final delivery of the product. The complete variety is available in grey color, and like a beetle shoe. 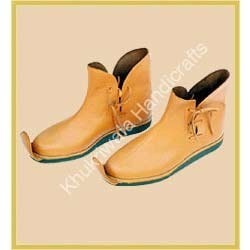 This has an attractive design and can be modified as per the choice of the customers. These are highly appreciated for their light weight, multiples hues and longer service life. Khukriwala Handicraftsis incepted in the year 2005. We are engaged in manufacturing and exporting a wide range of Khukuri Profiles. Our range of products includes Medieval Body Armor, Medieval Axes, Medieval Polearms & Chainmail Armor etc. Our products are manufactured using premium quality materials that are tested for their quality and efficiency. They are available in customized specifications as per the requirements of the clients. We are supported with a team of highly experienced professionals who help us in offering qualitative range of products to our clients. By the inspiring guidance of Mr.Akhlaquddin, is a motivational figure in our organization. He brings with him years of industry experience and expertise that influences our team and helps them gain the required expertise in manufacturing these products.